"Back in the early 70s, probably 1971 or 1972, I picked up a copy of André Kertész’s On Reading, which was recently published. I was impressed by and a bit envious of his black-and-white photographs of people in different cities around the world engaged in the act of reading. Kertész was a native of Hungary (b. 1894), but he also lived in Paris and New York where he created many of his images. He traveled to Venice, Tokyo, Manila, Buenos Aires, and elsewhere, photographing his subjects. On Reading was first printed in 1971, coincidentally, the same year Diane Arbus (b. 1923) took her own life at the age of 48. In 1971, I was eighteen and had just quit my sophomore year of college in New York. I was surviving, temporarily, working as a waiter at a neighborhood diner at the corner of 90th Street and Broadway on the Upper West Side. I started my shift each morning, five days a week, at 7 a.m., at about the same time a dozen or so “regulars” began sauntering in to claim their favorite tables; seniors who were mostly stylish, elderly women. One of the “regulars” was an affluent-looking senior with a basket of brown hair and a fixed, melancholy frown. She didn’t socialize, and spoke in a soft, pleasant whisper: “Oatmeal.” "
I was fairly ignorant about photography in those days, and didn’t own a camera, but in the late 70s I was eager to see for myself what all the fuss over Diane Arbus was about. So I plunked down the $12.50 for a paperback edition of the monograph. I turned the unnumbered pages reverently, doting over each of her gutsy images, marveling at this visual artist’s superior intuition bordering on the clairvoyant. Since then I have continued to seek out the readers, despite, and sometimes because of, the shuttering of bookshops and the ubiquity of the web and impersonal electronic reading devices. 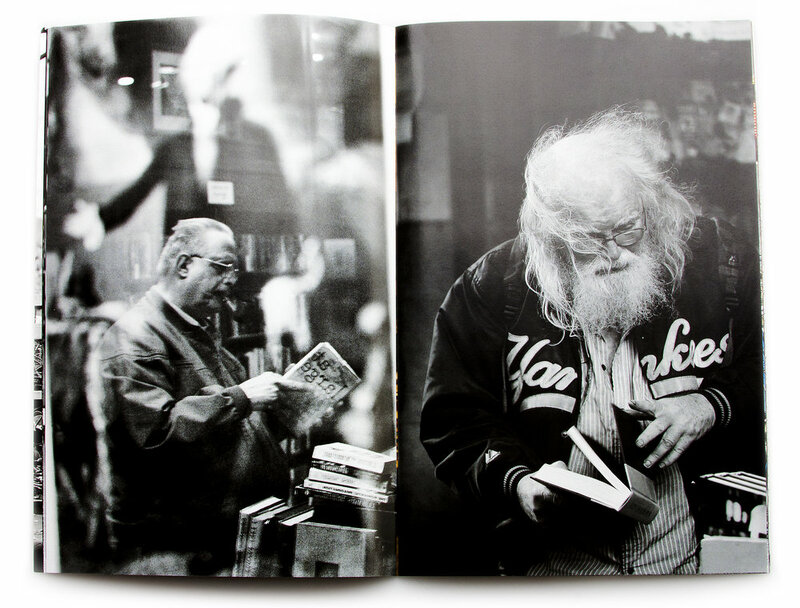 I discretely photograph my subjects, most are solitary and often incongruous, desperate, or vulnerable, engaged in what seems to be a vanishing art—the Art of Reading. 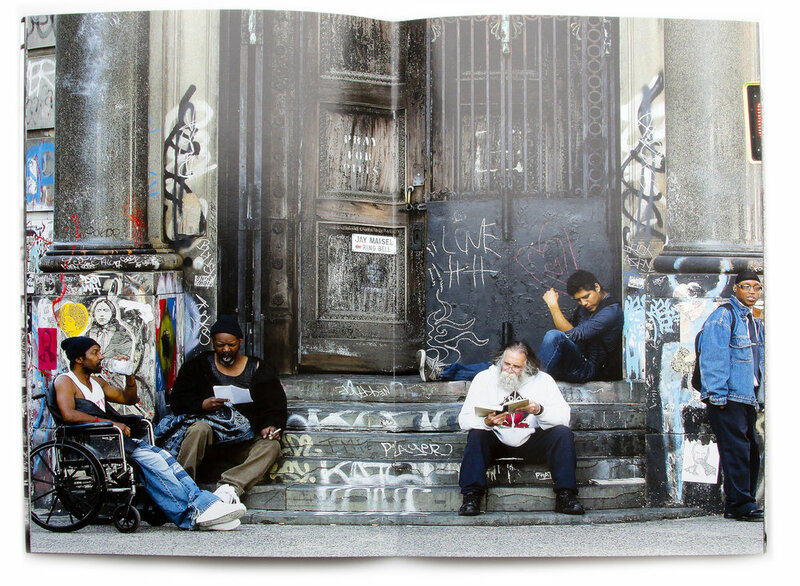 Lawrence Schwartzwald’s book ‘READING NEW YORK might be short but is packed in cultural symbols, meanings and behaviors. I decided to include much of Lawrance’s story and statement because I found the story to echo in his book, and felt it was important to know before the review itself. New York city is ever changing; it’s the city of the big screen and a dream city to many of us from across the world. This book takes a small manner, behavior, mundane action such as reading a book, and tells the story of this crazy city. 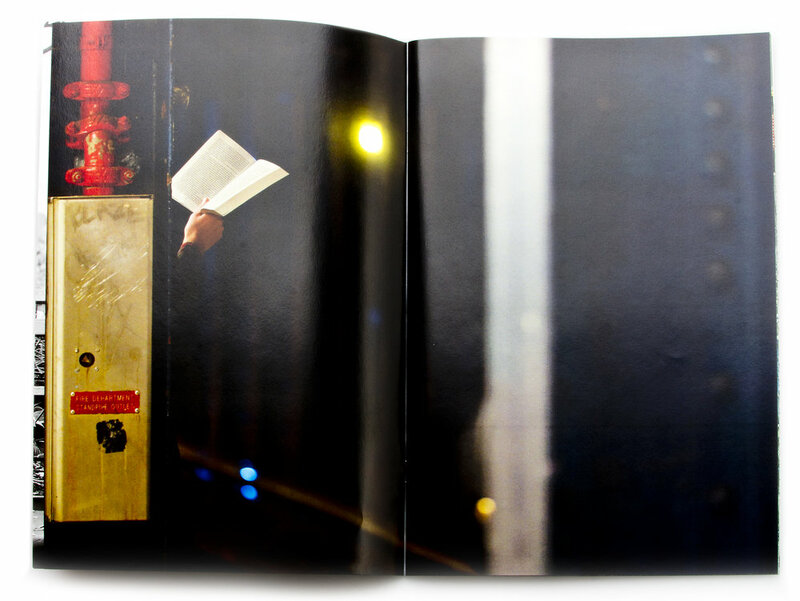 Each photo in the book captures a moment of silence, focusing on an individual in a moment where they are connected to the book, immersed in the city. This allows the camera to capture them in a genuine moment, capturing their spirit. The images capture some really beautiful human relationships and interactions. The people in the photos might not be interacting with each other, but they share a physical space together, creating a moment that is now captured in a photograph. There are wonderful juxtapositions in Lawrence’s images and because there are no borders, the images seemingly blend into each other. The people in the images seem to share the same space, even if they might not share it in real life. The book joins them together allowing it to become one scene. If you feel like getting a copy of the book, you can grab a copy of it in person at McNally Jackson Books and at Dashwood book store in….New York City – of course!